Every day I am thankful that the pun gene leap-frogged right over me to you, Little Sis. Honestly, if anyone had heard me groan my way through this post they would think there was a giant frog up here! Please don’t say you toad me so, I could get jumpy. See, even you have succumbed to punning. I’m glad I put a smile on your face. *Laughs so hard tears form in her eyelashes* Wooooo! Let me catch my breath. Okay, wait— *Laughs some more* —I think I just about lost my mind reading this one. Your writing makes me so happy! You know, this is a real problem. I’ve been worrying about this set of issues myself, and I recently read another blog post that tackled this issue from another angle. What I’m doing now, in fits and starts, is setting a kitchen timer to limit the amount of time I spend on social media, reading blogs, and commenting. Writing has to be the first priority for me because when it is not, I become very cranky. That’s where it starts, anyway, with a bad mood— and it goes downhill slippery-slop from there. As always, I am glad you are writing about the issues right in front of all of us, and doing so with panache. Thank you, Yearstricken! I am also giving this some serious thought. I had no idea what blogging was about when i started this blog. It’s hard keeping up. Girrrrrrrl, I did months of research. But, I’m, um, what is the word? Ah, yes. Obnoxious. Even with that research, there turned out to be elements I could not have predicted nor anticipated. Blogging has an intimacy that I am not accustomed to as a writer; the immediacy of it still startles me. And a blog is like a living thing— it requires a certain amount of everyday attention. Still figuring out the balance. Now, where did I put that kitchen timer? It could easily become a full-time job just keeping up. Very addictive. Good one! We both wrote about frogs today. Cosmic, yes? We must have both been influenced by Leap Day. :-). If that’s the case, you definitely got the better half of gray matter. Susan, I am flattered that you think I have a brain. Thank you. LOL! You kill me.I love your sense of humor. What a marvelous comparison. You have convinced me completely. Now, what do frogs do for fun? I must do some research and find out. I like the term “froggery” as well. Hello from the blog pond. I sometimes wonder what I did with my time before I started to blog and I can never quite remember. I know what you mean. How did I fill those hours? Wonderful. And great to be here with you in the pond. I’m glad to be sharing it with people like you. I am goggle-eyed with wonder at your genius. I’ve wanted to be this smart ever since I was a little tadpole. You make my heart leap with joy! 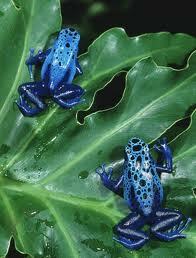 Well, frogs are good luck in some cultures, so maybe that’s why they are appearing around the blogosphere. Omigosh this explains everything!!! THANK YOU!! I’m glad it made sense to you, Natalie. This post made me feel sheepish (wait! wrong animal!) while reading it and again now while commenting. I’d never thought of myself as part of a bloggery before. But I did have to read this one aloud and share it with my husband! Thanks for all the laughs. This is absolutely, fiendishly wonderful. My husband must have given you that quote for the obit. And an early happy leap year to you! It’s a struggle to stay in the real world when the blog world is calling. It makes me glad to hear that you liked it. It is a good word to explain the two lives they live – first in water, then on land. I’m glad you hopped over too. It is a bit scary. 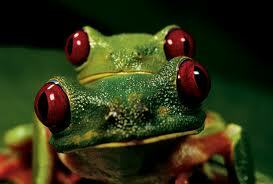 I’m still mulling over the fact that when frogs croak, they speak; but when people croak, they stop speaking. 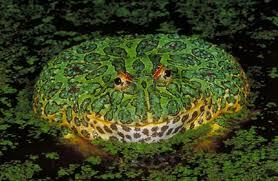 I love frogs! Cute, cute pictures! Thanks, I’m glad you like them. The site I got them from has some really cute ones. This is fascinating, Pat. 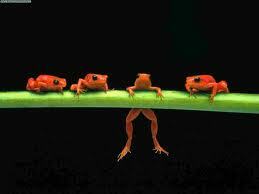 Frogs are full of surprises, just like bloggers. Thanks for sharing that. Such a delightful way to tell the truth about all of us jumping from post to post. Thanks, Myrah. I always enjoy jumping over to your blog. I have to thank you for this post. I have been on somewhat (one of those “some” words) of a hiatus from blogging because of sheer fatigue and feeling guilt. I am not going to claim ownership of that guilt though, because my very real family, my very real job and my very real life really do deserve the best of me. That said, it has been wonderful to get back to your blog pond – it lily has been fun. oops – “HAVE BEEN feeling guilt.” Why don’t I proofread myself?! I know exactly how you feel, Cyndi. I have had to slow down a bit because my job and family need me and they are my first responsibilities. I love your pun with “lily.” And I’m glad you have some time to spend in the pond.